The blue crab, Callinectes sapidus Rathbun, 1896, represents the second most important fishery for coastal Georgia; yet, little is known about environmental forces that affect planktonic postlarval settlement in the region. 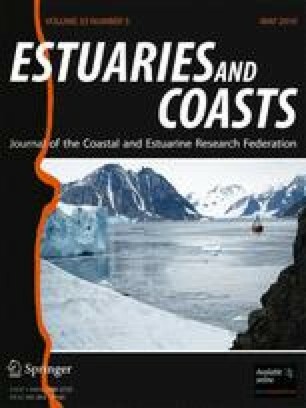 Here, we describe a study to examine the physical mechanisms responsible for blue crab settlement in the extensive salt marsh system of coastal Georgia. Bottom and surface samplers were placed at three sites along a salinity gradient from a low-salinity site in the Altamaha River to a high-salinity area of the Duplin River, Sapelo Island, GA, USA during 2005. Megalopae and juvenile monitoring occurred from July through December. The majority of both megalopae (86.8%) and juvenile (89.3%) blue crabs were recovered in bottom samplers at the low-salinity Altamaha River site during August and early September. Few megalopae were collected at the surface of the Altamaha River or at the two higher-salinity sites in the Duplin and North Rivers. Downwelling winds were unable to explain all settlement events; however, winds with an onshore component regularly preceded settlement events. The use of a multiple-regression model revealed a lagged relationship (r = 0.5461, \( lag = 0–2 days \)) between wind events, temperature, salinity, maximum tidal height, and settlement. The authors wish to thank the Sapelo Island National Estuarine Research Reserve for its financial and logistical support of this study. The GCE-LTER program in partnership with the Sapelo Island National Estuarine Research Reserve is thanked for the water temperature and salinity data. Also, partial funding for Bishop was provided by the GCE-LTER (NSF OCE-998213). This is contribution number 27 of the Marine Science Center at the University of New England. This is contribution number 992 of the University of Georgia Marine Institute.